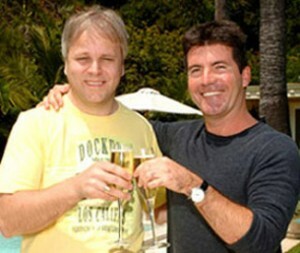 Jorgen Elofsson with Simon Cowell. Update: In 2013 Jorgen Elofsson co-wrote the #1 hit for Kelly Clarkson, “Stronger (What Doesn’t Kill You).” This article was written in 2005. The name of Swedish songwriter Jorgen Elofsson may not be well known (in the U.S.), but anyone who has turned on a radio or television nearly anywhere in the world has heard his music. 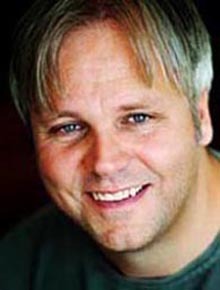 He has penned global hits for Britney Spears (‘Sometimes’ and ‘You Drive Me Crazy’), Kelly Clarkson (‘A Moment Like This”), U.K. sensation Westlife, and he contributed two songs to Simon Cowell’s pop-opera creation, Il Divo. As he celebrates 10 years with BMG Publishing and sales of 100 million units, Elofsson discusses the craft of songwriting, and how he began working with Cowell and writing for many of the Pop Idol artists around the world. By 1987, Elofsson decided to get more serious. ‘With the bands, it was all fun, then we’d split up. I seemed to be the only one working. So I kind of quit. I decided if this was going to happen, I was going to have to do it on my own, so I started a solo career.’ He signed with Sweden’s CBS Records, where he released two albums with minimal success. Elofsson signed with BMG Publishing in early 1995, and started working with European artist Dr. Alban at Cheiron Productions (of Britney Spears/Backstreet Boys fame) and became acquainted with longtime collaborators David Krueger and Per Magnusson. It was while working with Westlife that Elofsson met A&R executive Simon Cowell. ‘Simon got Westlife together and signed them, and then he came to Cheiron Studios to get the songs, and that’s how we got together. Over the years I’ve gotten to know him and worked with all of his projects. Now he’s going crazy in America and with huge success. He’s doing this Il Divo thing now, which is [becoming popular] everywhere in the world. It’s selling like crazy.’ Two of the tracks on Il Divo’s self-titled album are Elofsson’s songs, ‘Feelings’ and ‘As Far As Any Man Can See’. More recently, Elofsson has found major success writing songs for Pop Idol winners in six different countries including the U.K.’s Will Young and Gareth Gates (‘Evergreen’ and ‘Anyone of Us’), The Netherlands’ Jamai (‘Step Right Up’), Guy Sebastian and Shannon Noll of Australia (‘Angels Brought Me Here’), and ‘Coming True’ for Daniel Lindstrom of Sweden. American Idol winner Kelly Clarkson’s recording of ‘A Moment Like This’ (co-written with John Reid) went straight to the top of Billboard’s charts, and is featured in a television ad campaign for Sandals Resorts. He also co-wrote (with Ana Johnsson) ‘We Are,’ the main theme for 2004’s blockbuster movie, Spiderman 2. Jayne Moore is a freelance music/entertainment journalist. She has launched a new service, writing bios, articles and press releases. Moore can be contacted at [email protected]. You can also visit her website: www.musicgerm.com.